For any gamer, A good headset is a must so we’ve created this breakdown to find you the best gaming headset under $100. You shouldn’t have to spend a ton to get good results and unless you plan to invest in an expensive DAC you don’t have to. In this guide, we’ll break down the different areas of focus and help you decide on your best choice for a gaming headset. Our guide is going to be focusing on PC gaming headphones but some of our reviewed devices support both Xbox and PS4. Therefore, we’ll be sure to mention it when applicable. In this guide, we’re going to rank each headset on 3 main key factors. First is the sound quality of both the headphones and mic. We’ve all been on the receiving end of somebody with an absolute god awful microphone and nobody wants to game with that guy. Secondly, the overall build quality. If you end up dropping your headset or worse yet throwing it, you’re going to want to know if it will hold up afterwards. And finally, the aesthetic design. While the looks of a headset are usually subjective, I’m going to have to be a critic for the sake of determining the best gaming headset under $100. Comfort is a major Contributing factor. For this reason, we’ll be excluding any headphones that do not provide sufficient comfort for long gaming sessions. Although some gaming headsets are more comfortable than others, we must set this minimum bar. Whether it be microfiber or pleather, choosing the right earcups for you is essential for long periods of gaming. Along with the right padding for the top of your head. The biggest difference between these two connectors comes down to the fact that USB uses its own DAC and amp and amp inside of the headset and bypasses onboard. It is a common misconception that onboard audio is bad. In fact, most onboard audio chipsets are high quality and can compete well against lower end DACs. Now this doesn’t mean 3.5mm is always a better solution. USB is great if you don’t have front audio io or you want to go wireless. For headsets under $100 you probably won’t be able to tell any real noticeable difference unless you’re an audio aficionado. Considering we’re focused on headsets specifically for gaming wired does usually provide better sound levels. However, nobody can deny the usefulness of not having a clunky wire get in your way. Listening to your favorite twitch stream and need to use the bathroom? Hey no problem! But how much of a difference in quality do we trade off? It’s noticeable if you’re looking for it but that quality degradation does come with some benefits. This one is a given and when transitioning to a wireless headset you feel like you’ve been set free from prison. •Couch Gaming: I’m sure I’m not the only one who connects his TV to his PC. It’s great for when I just want to be a casual and play some Rocket League. •Durability: I can’t tell you how many times I’ve either ran over my headset cable with my chair, had my drunk roommate trip over the cable or even tried walking away with my gaming headset on. If you’ve ever had wireless headphones then you know the feeling of panic when you’re knee deep in noob blood and hear the warning sound of your batteries dying. Although, the best gaming headsets are known to go for 8 hours plus before dying. •Interference: If you’re using a lot of wireless devices you can get RFI (radio frequency interference) and it can cause cracking in your headphones. •Compatibility: a 3.5mm audio jack means you can use it with just about anything (except maybe the newest iPhones). Now that we’ve got you covered on what makes for the best gaming headset, Let’s dive into our top picks. 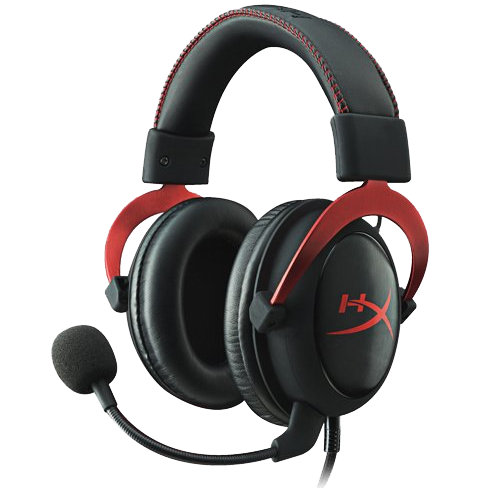 The HyperX Cloud II is a stylish, lightweight and comfortable headset. It includes both plush and pleather ear covers which is great to people who don’t care for one or the other. But how does it perform? Well, the mids and highs offer great sound but the base is lackluster. The 7.1 surround feature definitely makes a difference when distinguishing player movements and gunfire. The microphone quality is quite adequate and there are no complaints to those listening on the other end. Although don’t expect the quality you’d get with a studio microphone. The design is sleek and not over the top with a red or grey aluminum coating on the support for the earcups and a matte black for the rest. It has both 3.5 and USB compatibility although you lose out on that 7.1 functionality if you choose the 3.5mm. Overall the HyperX Cloud II is fantastic gaming headset for just under $100 and if wireless isn’t your thing then this would be the headset I advise you to pick up. One thing that can be said about the SteelSeries Arctis 5 Gaming headset is that it’s fantastic aesthetics. It’s sleek black design with integrated RGB lighting makes for a cool look. 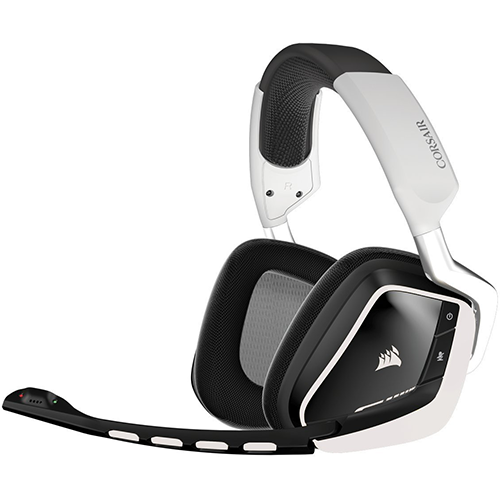 Additionally, the headset comes in white. The Arcis 5 comes with a volume control panel pass-through and uses a proprietary USB cable, which isn’t necessarily a good thing (finding a replacement can be an issue). But, it does have a 3.5mm adapter for use with other audio devices like an Xbox or PS4. 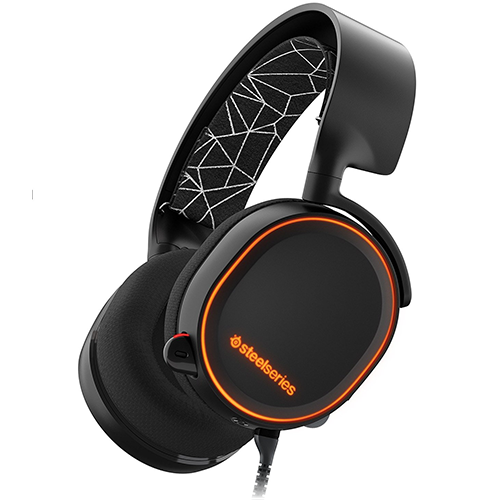 The gaming headset comes with a cloth head strap that can be changed out with others from SteelSeries (only one is include). Furthermore, the RGB is completely customizable through the software that comes with the headset to get the effects and colors you want. The included extendable microphone has an impressive level of sound at this price point. If you’re wanting to stream on twitch or record videos at an entry level, this would definitely be acceptable. These headphones provide great comfort for long sessions with their ear cushions having a microfiber like material. So, what’s it sound like? Well, out of all the headsets in this list the Arctis 5 has the best overall quality given its software allows fantastic customizability. Plus the surround is great making it one of the best gaming headsets under $100. First off, Razers Kraken Chroma is a massive headset, and like the Arctis, includes a retractable microphone. Additionally, the Kraken is an USB only gaming headset so no 3.5mm audio jack which some might find a deal breaker. What it does do however is link up with Razers in house software to provide a synchronized RGB effect with the rest of your Razer gear. So, the value proposition razer offers is something we really like. It’s got great features especially for sound and it’s got a solid build quality. Additionally, the comfort offered with the Kraken can keep you gaming for hours without any problem. We would have liked to see a 3.5mm option included but the reason behind this is, most likely, the power LEDs draw limit that. Providing you’re a Razer fan or have some of their other peripherals and want to link up all the lighting effects, then you should consider picking up the Kraken. 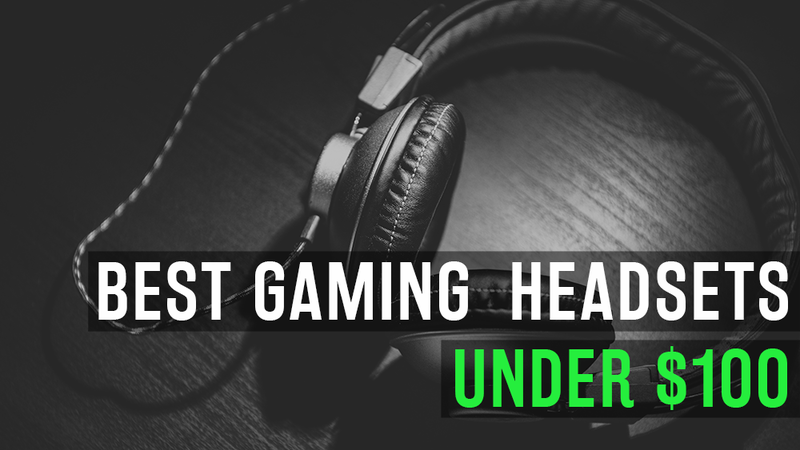 If don’t care about lighting and just want the best sounding gaming headset under $100 then you might want to consider one of the other products in this list. 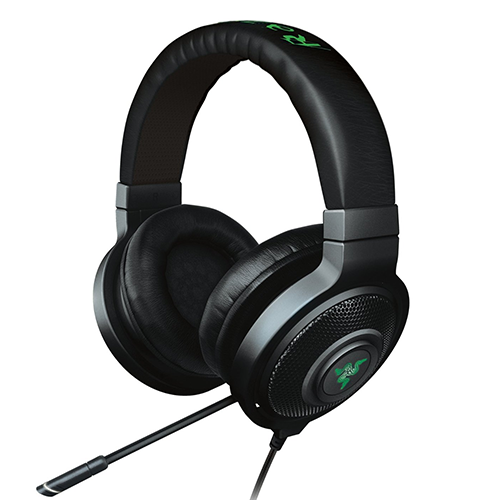 If you do pick up these gaming headphones, then you might want to look at Razers headphone stand here to pair up with it. Originally the price of the G633 was set at $149 MSRP but has been steady under our price point for the last few months so I felt comfortable including it into this list. 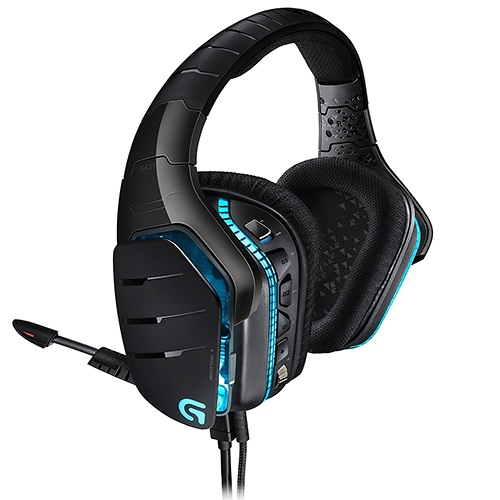 Logitech have always had a good history of providing great quality gaming headsets over the years and the G633 is no exception. I will be the first to admit that from the pictures, the G633 looks tacky. However, this isn’t the case. The lighting is much more subtle then the marketing pictures show, which is a good thing. The build quality is great, even though it feels flimsy due to its lightweight design. You shouldn’t expect to break the G633 very easily. The earcups are fantastic, not touching your ears while providing excellent comfort for 8+ hours of gaming. The Logitech G633 have probably my favorite earcups from the entire list. The headset has a volume wheel, a mute button, and 3 programmable G-keys that can be mapped to anything you want using Logitech’s software. 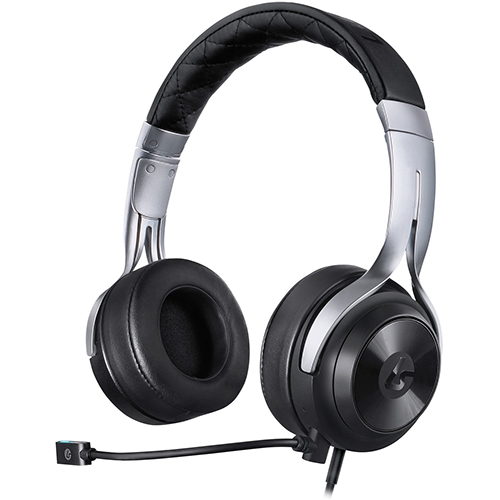 The microphone has adequate sound like the other gaming headsets in this guide and has the same playback function as the Turtle Beach Stealth 450. Overall Logitech gives a great value proposition given the price has dropped over 30% of the original MSRP. You get excellent sound, great functionality and sleek aesthetics all coming in just under our $100 budget. Plus, for an additional $40 you have the option to go wireless. The Lucidsound LS20 is incredibly versatile. You’re able to use this as a gaming headset for PC, PS4 and Xbox. In addition to being a low profile everyday driver for your phone. Most people would be embarrassed if they took their gaming headset out for a walk in the park, but with the LS20 it is just as stylish as Beats by Dre. The LS20 also includes two microphones, one detectable boom mic, and one that’s built right in. This gives you the option to take calls while on the go. The build quality is premium and you won’t have to worry about breaking them. Aesthetics have a modern low-key look to them which many college students will appreciate. The LS20s have on-ear earcups, which is unique in this market. They’re made from a pleather like material but are surprisingly comfortable. Although, you may not want to use these for extremely long gaming sessions (eight hours plus). The bass is deep, the mids are great and the highs are fantastic. If you’re in need of a great overall headset and want to replace your everyday headphones this is a great 2-for-1. Corsairs VOID RGB is another one of their RGB lineup that uses the corsair CUE software to sync up lighting with other peripherals and components. It’s a great easy to use software that makes setting your preferred lighting effects a breeze. One note about the lighting is that it can really drain your battery life. You can easily get 20 hours of life if you have turn off the RGB effects where you’re lucky to get 8 with it on. Just something to consider when picking up this headset. The design aesthetics is very modern and simple. In case with all of corsair’s products. The microphone has good sound and you won’t hear any complaints from the people on the other end. However, it would have been nice to have a retracting or detachable mic to help protect it from damage. For under $100 though, it’s understandable. The slight curve that the headset has makes it sit further forward then most other gaming headsets, and can sometimes slide too far and become uncomfortable. However, the earmuffs are very comfortable and you shouldn’t have a problem once you get used to the design. Overall the Corsair VOID RGB is a great headset if you’re looking to get a decent pair of wireless headphones under $100 and are invested in the Corsair RGB ecosystem. 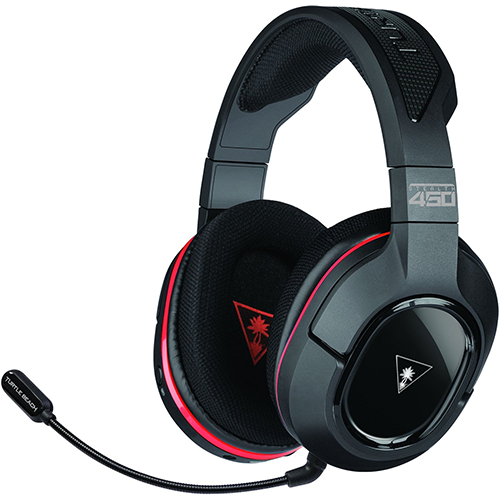 The Turtle Beach Stealth 450 is a well-rounded high quality gaming headset. Coming in right below budget, the Stealth 450 has fantastic sounds and great customizability. With 4 different preset audio settings, the 450 provides adequate lows and crisp highs. All while providing a long battery life for intense gaming sessions. Turtle Beach has never been one of my favorite brands. They always have seemed to come off as cheap, but I was surprised by this headset. It has great build quality, simple aesthetics, and provides a great overall experience. Additionally, the Stealth 450 is extremely light which is fantastic. One unique feature is the microphone playback option. This gives you the ability to detect your own voice and helps prevent you from mouth breathing, smacking or any other annoying habits you might not know you have. Your friends will definitely appreciate this feature. The 7.1 simulated surround sound feature is a nice touch as it helps detect enemies in FPS games by listening for footsteps and gunfire. Furthermore, if you’re looking to get the biggest edge up on your opponents this might be the best headset in our lineup. It’s another year of the RGB take over with more focus on build quality and aesthetics than overall sound quality in this price point. While for audiophiles you may want to up your budget if getting the best sounds is what is right for you. If you have any suggestions for new headsets we should look at feel free to post them in the comments and if you do end up picking up a headset, consider look at our guide to headphone stands while you’re at it. Thank you for checking out our guide on the best gaming headset under $100.